A 5S System is a low-cost system that is easy to put in place and has many benefits to your company or department. If you have thought of implementing a 5S System Spring is the perfect time. Everyone is used to “spring cleaning” so the mindset is already in place. Start by doing Gemba Walk to see how people work and obvious areas for improvement. Kaizen is about daily improvement, a change for the better and this is the goal of a 5S System. Use the Kaizen approach to look at your workplace to see where improvements can be made to create a more efficient and better work environment. A 5S System is not a complicated best practice. It is a simple foundation on which you can build to make further improvements in your workplace. With a successful implementation of a 5S System you will raise the morale of the workplace and by getting workers to take part you open the door for many more improvements. The 5S System was developed for the manufacturing environment, but can be adapted to any workplace environment. Whether you are starting a 5S System for your office (see below) or any other department the basic concepts are the same. Sort – The sort step is where you remove everything from the workplace that is not used or needed to do the work. Straighten – The straighten step is based on the foundation “A place for everything and everything in its place”. Shine – The shine step is about cleaning the workplace and keeping it clean. Standardize – The standardize step is about making the 5S System’s first three steps part of the daily routine. Sustain – The sustain step is about changing the culture and creating the discipline needed to sustain the 5S System. As you can see above there are 5 basic steps to a 5S System. The first three steps are the meat of the system. These are the work steps that produce the results. The last two steps are about installing a system to follow and changing the culture of the workplace so it becomes a daily habit. This set of articles will introduce you to the basics of a 5S System. There are several keys to a successful 5S System. The two most important are the planning phase and the launch phase. Educating yourself on 5S, what it is and what it is about. Getting management and leadership to buy in. This should be an easy sell since the cost is low and the benefits are high. Establishing your 5S Team. A 5S System needs a team approach with members who represent a cross-section of your workplace. They should be your most knowledgeable people on how the workplace functions, what works and where improvements are needed. Educate them about 5S and the benefits. Working with your 5S Team decide how a 5S System will fit into your workplace. Take the basic 5S System and adapt it. Listen to your 5S Team since these are the people who do the work. They know what works best and where improvements are needed. Get them onboard and you will have less resistance from other workers. Create a plan for how each of the first three steps will be carried out, how it will be standardized so it becomes a daily habit and how it will be sustained to change the culture of the workplace. Where will you start? If the workplace is small you can do it all at once. If it is large it is best to start in one area and move to others once the system is in place. Gathering all the tools and supplies you will need to do the first three steps. Creating a reinforcement system such as a bulletin board and a reward or recognition system to inspire and enforce the 5S System. Designating areas for the sort step. Lots of trash and junk will be generated so plan where it will go and how you will handle it. Create a system for handling the straighten step. This step is about organizing for efficiency. Remember, “A place for everything and everything in its place”. This means you must designate areas where everything goes. You don’t want the workplace cluttered up with items that are not needed to do the work, but if they are items you need time and again you will need a place to store them near where the work is done. Consider the layout of your workplace. Is it efficient? One of the benefits of a 5S System is improving your work flow. Create areas to store supplies to do the work close to where the work is done, not in a remote location. Can furniture or be arranged to make it easier for workers to move around? Can office equipment be move to more central locations? Finally decide on a launch date. A casual Friday is the perfect time to launch your 5S System. For more information on how to plan for a 5S System launch read How to Plan a 5S System Launch. As I said a 5S System can be adapted for any work environment including the office. A 5S Office system is a process to make sure work areas are clean and organized. The goal for implementing a 5S System in the office environment is to make the office clean, organized and more efficient. You will be able to find what you need, when you need it and know exactly where everything is. If you want to start a 5S Office System read these articles to find out how to adapt 5S to the office environment. 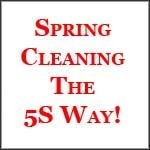 Spring time is the perfect time to start a 5S System in your workplace. A 5S System can be adapted to any work environment. It is a low-cost way to bring many benefits to your workplace. A 5S System lays the foundation on which you can build on for a more efficient and pleasant work environment. A 5S System is not rocket science. It is easy to learn, plan and start. Educate yourself, form a 5S Team who will help you and create a 5S System plan. When you are ready to launch your 5S System take time to educate everyone on what 5S is and the many benefits. Expect resistance to change, but build in a system to sustain your 5S System and eventually it will become a habit. If you want your employees to buy in to a 5S System a word of advice. Don’t go overboard with it. People are naturally resistant to change so start small. Read “5S System Challenges – Slow and Steady Implementation” for more tips. You want to sustain a 5S System by enforcing it, but nobody wants the “5S Police” after them. Once your 5S System is in place and running well look for other areas of improvement. Use the Kaizen approach, do more Gemba Walks and see where improvements can be made. Does the break room need to be updated? Is the office furniture or equipment outdated, broken or just plain old? There are many areas for improvements that will create an even more compelling place to work.